Cat owners often pamper their cats, because they are treated as one of the family, and now with so many cool designer quality indoor cat furniture products on the market you can pamper them even more. Indoor cat furniture has come a long way in recent years, and many cat owners do not realize how many good quality products are out there that will fit in with your own furniture and decor. Having said that, we will take a look at some good quality Amazon products specifically designed for both you and your cats, and some advice when it comes to purchasing these amazing products too. Click on the product images 1-4 below for a more detailed description of them and their cost. One of the most unsightly things for visitors is the cat litter tray, whether it be in a hallway, bathroom or porch, visitors are going to either see it or smell it even though you don’t notice it. Therefore, there is a great product out now, which is actual furniture that hides the cat litter tray, so it is out of sight completely, and automatically deodorizes, so it doesn’t even smell. These designer cat litter boxes come in all shapes, and sizes as well as a number of colors to suit your existing furniture and decor. With that said, for visitors it just looks like a nice cupboard, shelving unit, or sideboard, and many will even comment on how nice it looks without even realizing what its true purpose is. You can clean it out now! 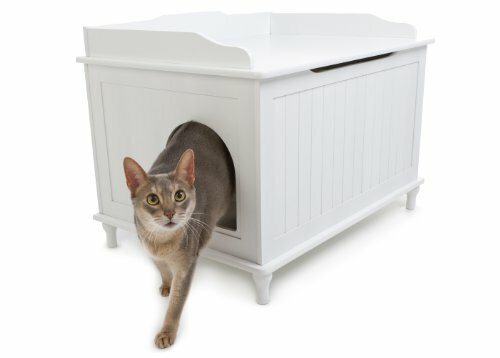 Hidden cat litter tray furniture is probably one of the most popular things cat owners are buying now simply because they look great. Some are designed to look like tables, while some have a flower pot design with an entrance for the cat facing away from prying eyes, which also makes the cat feel more secure and comfortable while using it. These designer cat litter trays are very well priced, and affordable for most cat owners, ranging from as little as $40 or $50 up to $300, or more depending on the design and model you choose. You can review the range from this Amazon link. Now, we all know cats need to climb and perch up high, and it’s usually our curtain rail, or bookcase or some other piece of furniture we would rather them not sink their claws into. However, in recent years more, and more cat owners are buying cat towers for them to climb, perch and even scratch, because many cat towers include many other attributes for the cat, like scratching posts. 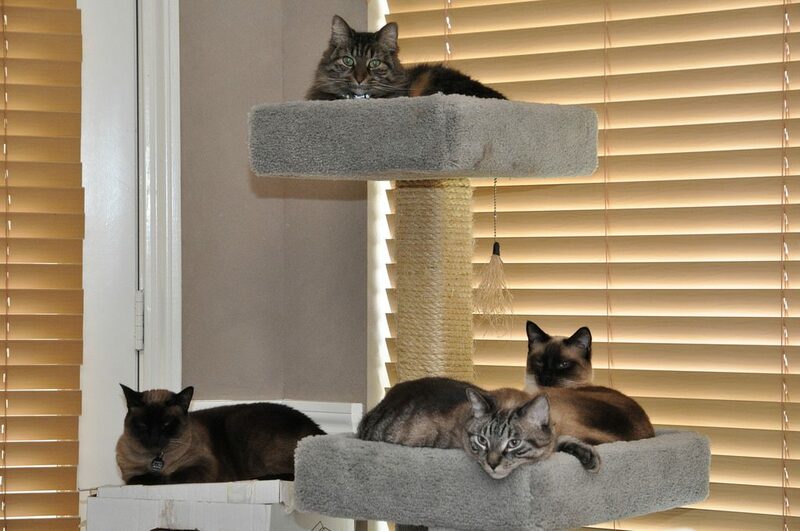 In addition, manufacturers have taken it one step further, and created cat mansions, which are basic cat towers, but with much more added on, much higher, and with more perching spots. Loads of fun here for your pet! Many of these cat mansions are not only good looking in any home, but come in a wide variety of designs, and colors to fit your home and look natural. Moreover, because they have so much on them your cat will often want to spend most of his time on his cat mansion, and less time being bored and tearing up your furniture. Keep in mind, that prices can vary widely with cat towers, and mansions. Therefore, if you’re on a budget you can even buy smaller ones that can be added on to later. However, always look for a quality product that comes with a guarantee. 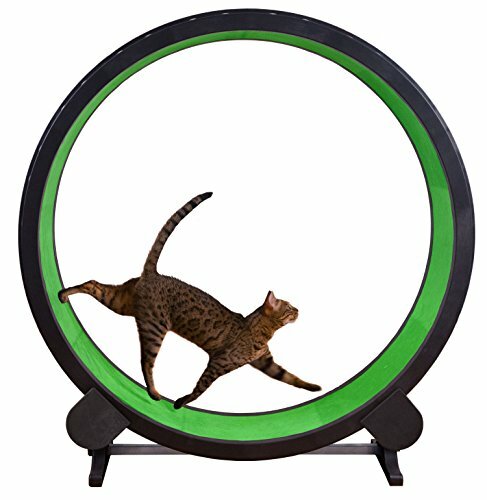 If you have an indoor cat, and you want him to get more exercise then maybe a cat wheel would be a great idea. However, keep in mind, that although some cats take a while to get used to this, once they do they often spend a lot of time on it. For those who haven’t yet heard of the cat wheel, think of a hamster in the ball, it is similar to that only it’s a wheel instead of a ball, and bigger and many cats love them. In fact, many owners say that since getting the wheel their cat is more leaner and healthier. Moreover, they also come in a variety of colors, and the price range is around $200 for the one illustrated below, but will last the life of the cat in most cases. 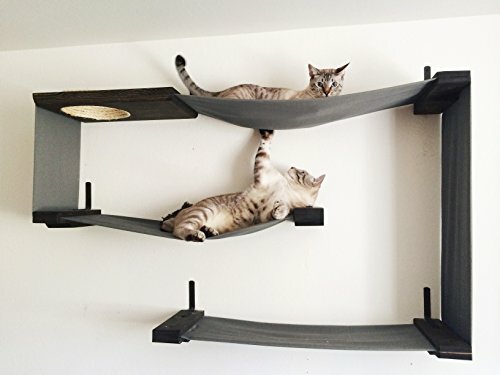 Another cool product for cats is the cat bridge. That said, these are usually called sky bridges or Indiana Jones cat bridges, and are designed to go across the top of a doorway or around the walls for the cat to perch, or walk around high up. Nevertheless, because they do like a birds eye view of their surroundings, this can be an ideal product for your pet. Cat bridges are excellent for cats, because it allows them to feel like they are outside, only inside, because it allows them to jump up, climb, and perch high up, which they often do outdoors. Cat bridges come in a variety of colors, sizes, prices, and range from as little as $10 up to $200, or more and many you can add on to at a later date if you so desire. There are hundreds of other cat products that are very innovative, and one could almost write a book about them there are so many. Here we have just shown you how far indoor cat furniture products have come, and some advice on what and how to choose. One of the main things to consider when shopping for indoor cat furniture is to think outside the box, or rather outside but inside. An indoor cat needs as much real life things to make him comfortable, healthier, and to keep him active so he stay fit and healthy for many years. When buying indoor cat furniture you generally get what you pay for, and many of these wonderful products will last the lifetime of your cat. Always buy products that have a guarantee, and try to buy from a reputable brand. However, if you like the look of a product, but don’t recognize the name or brand, check out reviews by pet owners that have already bought it, and tried it out. If you are checking out products from Amazon you can always look at their Customer Reviews section in this regard. It is easy to stay within budget if you shop around, especially online where the best deals are often the case as opposed to traveling and wasting gas money. Finally, by keeping your indoor cat fit, and healthy it can mean that he will live a longer life, because many indoor cats become lazy and obese due to long periods of inactivity. Therefore, some of the indoor cat furniture we have talked about as well as cat activity toys keeps your cat active, lean and healthy, which means less visits to the vet, saving you money. 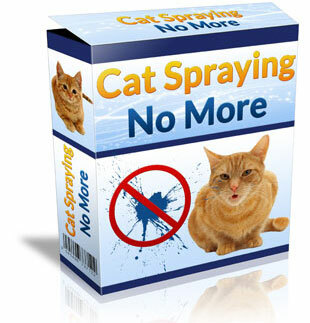 Moreover, your cat will be much happier with quality products specifically designed for them, and their health and you will be happier because he will have his own furniture and not be spoiling your furniture. Great products! I am not a cat owner, but my son is and these are great ideas for gifts for him. He loves his cat, but doesn’t do enough for his little furry pet. I love the hidden litter tray, this seems like a great idea for an apartment. The Cat bridge is also very cool! This is something that won’t take up space in his tiny apartment, yet gives the cat something to play on! Love it! Thanks very much for this feedback and very pleased you liked the products. Yes the hidden litter tray is a great product and cats will love the privacy that they have when using one. Thanks for those comments Manika. All cats love climbing. 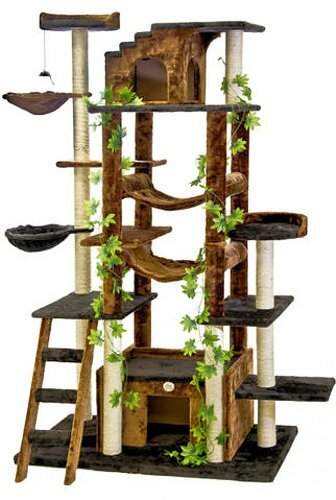 The outdoor variety have trees and rooftops to climb so it is important to have some type of climbing product in the house specifically for the indoor cat to use. Otherwise some mischievous cats will leave scratch and claw marks on your curtains and other furniture that they climb on. Hi there I have a cat and thought about getting him something cool to stay at. Found your post, I liked what I see, those products look so good and well made I would love getting one of them for my cat! Please that you enjoyed my article Anis and I hope you find what you looking for. Wow Jim, these products are extremely cool. I think you should take care of a cat like they are in the family. I am going to say everybody should have the covered litter box. that is very nice. Like us cats like their privacy when relieving themselves. And the fact that it deodorizes is a great feature itself. If I had a cat still I would have gotten the litter box right now. Great products. Nice feedback Ronnie and I agree with you that the covered litter box is a great product for indoor cats as they have their privacy in their own toilet building! I don’t have much furniture for my cats other than the cat tree, but i plan on getting some for them. Thanks for sharing a great list. 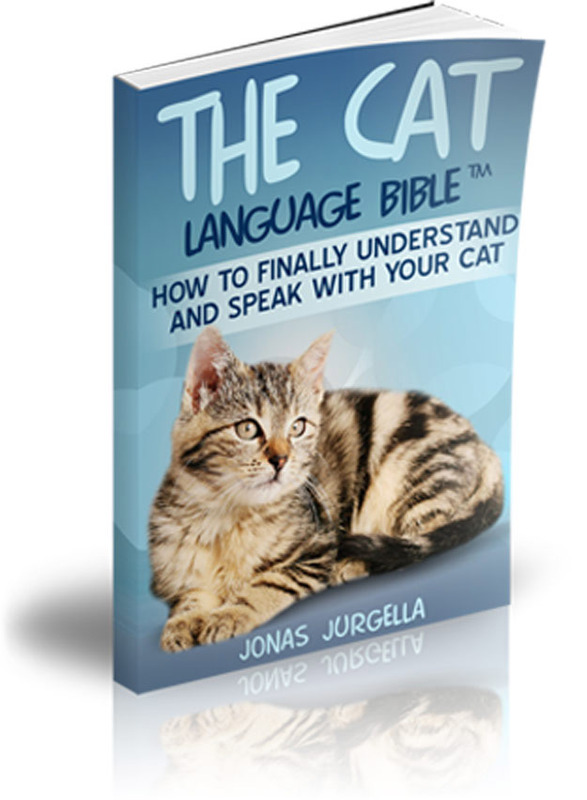 Thanks for those comments Ana and I hope my article gives you some ideas on what to buy for your cats. 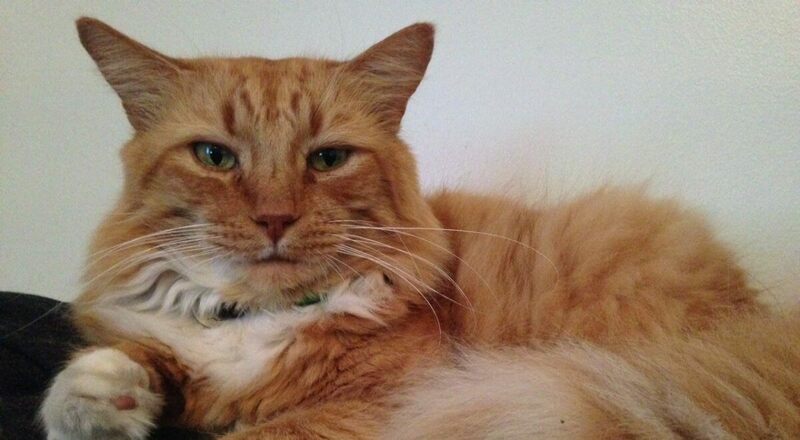 I have been searching the internet for ways to help improve our cat’s fitness following a potentially life threatening illness which, thankfully he seems to be making a good recuperation from and have found your site. I’m based in the UK, so will have to check around to see if the Cat Wheel is available here as this looks like a great way to help to encourage Alfie to lose a few lbs. It is very important to keep the cat stimulated as well, the items featured (excluding the hidden tray) all give a level of stimulation, scratching posts save the legs of precious furniture and they love being in places which are high up, inaccessible. What a wonderful article, I really enjoyed reading this and thank you for the suggestion of the Cat Wheel! Thanks for that awesome feedback Karen. Yes that Cat Wheel would certainly keep your cat very fit and help him shed some weight. It should be available in the UK. Both my cats love the towers and climbing posts, and the other thing they love is their cat beds, but you know sometimes I just can’t get them out of a box! I buy something, and like little kids, they want the box and don’t care about the contents, haha…and they will spend days and weeks or as long as I leave the box down, sleeping in it and scratching it to pieces. They also love their toys, their favourites are like mini snake toys they fling them about all over the place, and one of my cats loves paper balls too, screw him a napkin up and he flies about the house batting it and chasing it. Thanks again for this very informative and good read. Thanks Neil for those comments and yes I know what you are saying about boxes as one of my son’s cats Lily took a fancy to cardboard boxes in our house using them as a place to hide in and ultimately destroy! She also loved playing with toys. I love the cat litter box furniture! What a great idea. My daughter is moving into an apartment and what to do with the litter box? Perfect, will share it with her. My daughter who is nearly 4 has been begging for some time for a dog or a cat. My husband is almost ready to say yes to a cat, but I’m still on the fence… I’ve never had any indoor pets, so I’ve been concerned about the “animal smell” and the hair that gets everywhere that I notice in other people’s houses who DO have cats. Any chance that “hidden” cat litter box also has an odour trapper? And, what would you recommend about the cat hair problem? I’d love some advice, because I can see a cat in our future, whether I like it or not LOL. Thanks Marlaine for those great comments and I am sure your daughter would love to have a cat as a pet as they are particularly fun when they are at the kitten stage. The litter tray inside the cat litter box still need to be emptied and cleaned each day. You can buy a product called ‘Litter Tray Odour Absorber’ that reduces the problem of any lingering odours from the cat’s litter tray. As for the cat hair problem I have written an article on ‘Choosing A Cat Breed. Useful How To Decide Tips’ which includes a segment on ‘Short Haired Cats’ which are less of a hair shedding problem.